Society Hill Society (SHS) recently transformed the old Artful Dodger location at the corner of 2nd and Pine in Headhouse Square. My first reaction walking in the door was "wow, it's so bright!" If you'd been to the old bar, you'll be a little shocked to see how much bigger, more open and airy the space can be without a wall cutting it in half. SHS is now an appealing little neighborhood spot, which I'd recommend for anything from a first date to an outing with friends. Finished in a rustic copper, the bar is small enough to get close attention from the bartenders and immediately sets a tone of casual sophistication. Pairs or small groups are best at the bar but tables can accommodate parties of six or so. It was lovely to sit with another couple in the front corner picnic table, with fresh herbs growing in the window sill and the bustle of Headhouse Square just outside. The menu made it tough to choose - go with a group so you can try a few dishes. 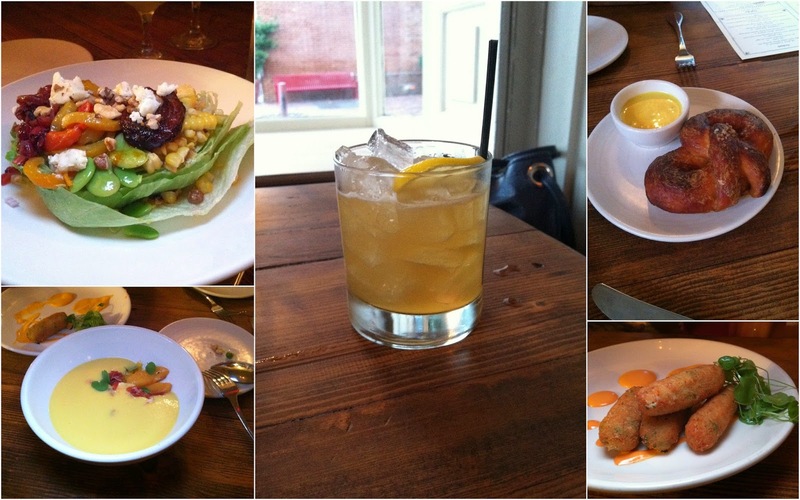 Here's a quick tour through what we ate off the late summer menu. I would expect some items to change for fall. The pictures above recap the starter selection that we ordered. In the middle: refreshing Thinking Machine cocktail with bourbon, lemon, coriander shrub and montenegro, a bittersweet liqueur. Clockwise from top right: complimentary housemade pretzel and mustard for each table; Chicken pot pie croquettes (great app! ); Chilled peach soup with goat cheese truffles, surryano ham and bell pepper; Market green salad with meyer lemon ranch (also a solid choice). It's worth asking the bartender or waiter to describe some of the cocktails that appeal to you. They sound like quirky combinations (mine had a shrub in it!) and the waiter knew them inside and out. The chicken and waffles entree jumped out to me immediately but could have been better... I'm not sure cornmeal-based waffles mix right with chicken (which isn't fried at SHS), and a runnier egg on top would have added more moisture to the dish. (Craig Laban disagreed). The gravy was loaded with chunks of more chicken and vegetables. That other thing sticking up in the picture below is a super crispy piece of skin to give you a little something fried. Bradd went with the burger with pork belly and cheddar on top. It's not a huge burger but extra juicy and plenty meaty enough to satisfy you for dinner. The waiter strongly recommended adding pork belly on top but we'd say go with more traditional topping like bacon. Lastly, the bourbon apple butter house doughnuts with caramel dipping sauce. PhillyMag called them the best new dessert for Autumn. Not sure I'd go that far but delicious they certainly were... and easy to share!